We are about to start a pumpkin unit study around here, and I thought I had all of the materials I needed to make a pumpkin themed sensory bin to go with it. I had made a fall themed sensory bin last year and was sure I had most of it leftover. When I went through my craft closet, I noticed the stuff was gone! I’m thinking it got tossed after a certain little miss chewed on some of the objects! Since I couldn’t run out to the Dollar Store to get new materials right away, I decided to go ahead and use what I had to throw together a sensory bin. I needed a sanity saver and I figured the kids would love it no matter what. The Hodge Podge sensory bin was born! I used dried Lima and navy beans for the base. I found some fake apples and flowers in my craft closet. Those apples would have gone great in my apple-themed sensory bin! I found some shiny stones and a little dip net, too! I simply added some cups and scoops and my hodge podge sensory bin was complete! The kids couldn’t wait to get their hands on it. Even though there was no particular “theme” they didn’t care. They loved the dip net, so much so that I think I need to get another one. While I was gathering supplies for this bin, I began to make mental notes of all of the themed sensory bins I could make with the supplies I had on hand. The Lima and navy beans would make an awesome base for a seashell-themed or rock-themed bin. The dip net would go great with a fish-themed bin. I thought the shiny blue stones would be cool with a frog-themed bin. The point of this post is to show you that you don’t necessarily have to go out and buy new things to make sensory bins. You can take the things you already have and make something fun for your kids! What are some of your favorite sensory bin ideas? 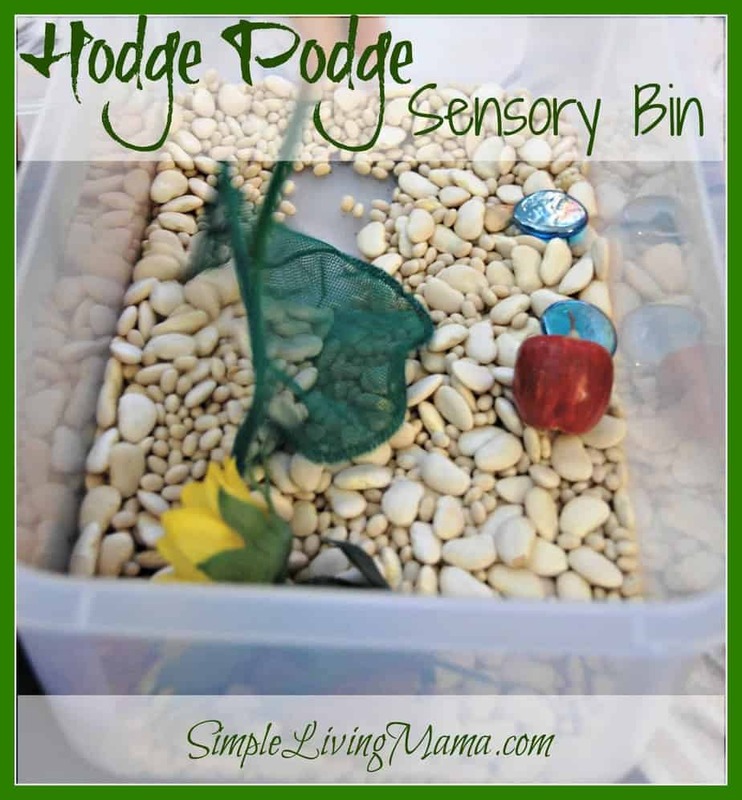 Great idea to just have a hodge podge sensory bin. It’s easy to get caught up thinking it all has to go together just so perfectly! This was a great reminder. Awesome idea! I am definitely going to try this. Thank you for linking up. I’m glad you liked the idea!